Encouraging, inspiring and empowering wellness. A cookbook with a difference, offering 117 healthy, balanced recipes alongside nutritional advice, empathetic quotes and inspirational messages. It will empower you to build a healthy relationship with food and your body for a happier, stronger you. Emma’s philosophy favours natural, unprocessed nutrition and moderation over elimination. Nutritional information about key ingredients sits alongside the delicious recipes, and self-help tools encourage compassionate self-reflection and the ability to self-soothe. Rebalance Your Relationship with Food combines the experiences of real people who have overcome disordered eating, body image issues and low self-esteem with trustworthy advice to effectively support long-term positive change in how you experience and interact with food and your body. Recommended reading for anyone wanting to develop a positive relationship with food, people in recovery from an eating disorder, adolescents, adults, teachers, parents, and mental health professionals. I think this is a beautiful book, with lovely illustrations, that will be very useful to all kinds of people who have worries about feeding themselves properly. The simplicity of the recipes and the clarity of the instructions will be very re-assuring to those who are nervous of trying to make food. The nutritional information will be tremendously helpful to those who feel that food might poison them or who can see no reason to eat. I liked the comments on each recipe from someone who has used it and found it helpful. The quantities are small – two servings at most; that should enable both over and under eaters to feel confident that the food is safe and will not trigger too much anxiety. This is a big book with lots of recipes, so for the person who works their way through it, it will last a long time. For the person who wants to sample it, there is lots of choice. The tone of the book is calm and authoritative; I am sure that many people will feel that they can trust it and use it as a guide to establishing a better relationship with food and better day to day nutrition. This empathetic handbook has been created for people affected by any form of disordered eating. Thoughtfully compiled by experienced authors, it will be a comprehensive guide through every stage of your recovery, from recognising and understanding your disorder and learning about treatment, to self-help tools and practical advice for maintaining recovery and looking to the future. Each chapter includes suggested objectives, tasks and reflections which are designed to help you think about, engage with, and express your thoughts, feelings and behaviours. It will encourage you to process the discoveries you make about yourself for positive and long-lasting change. Encouraging quotes are included throughout from people who have walked this path and found the help they needed to overcome their own disordered eating. You are not alone on this journey. Recommended reading for eating disorder sufferers, self-support groups, schools, teachers, counsellors, support workers and carers. It is becoming clearer that the treatment ethos that is most helpful for recovery from an eating disorder is one that includes a collaborative approach to care. This book is a wonderful compendium of resources that can be used as tools for the individual and the support team to work with a joint understanding. With helpful descriptions of the wide, eclectic variety of strategies that can be useful in fostering change, this book provides a diverse resource that can be shared in a collaborative way by patients, carers and professionals. This shopping cart is for UK orders only. People with an eating disorder get stuck into habits which isolate and harm them. This book provides a structure to build new healthy habits. The illustrations and recovery tips with a step by step shared approach provide the pathway to growth into a meaningful life. For families familiar with the roller coaster ride of supporting a loved one with an eating disorder, this book is a true gift. Instead of the plethora of diet plans, calorie counts, food diaries/charts, which services often advise, this book is complete in approach. It is written from the perspective of understanding what life is like for the person with the eating disorder and for those trying to support them to encourage recovery. This insight has enabled the book to be structured with the intention to abate the “ED voice” whenever it rears it`s ugly head. The quotes throughout the book and the section on Key Ingredients for a Powerful Life are very helpful and support positive thinking. Similarly, often misguided understanding about different food types is addressed with clear, sound advice. This is a book for families to use together and re-build trust on the journey to recovery. The importance of optimal nutrition for a healthy lifestyle cannot be overstated. Emma’s inspirational book is a comprehensive guide with easy to follow sections, providing a wide variety of tasty and nutritionally balanced recipes and meal ideas. It is accompanied by detailed nutritional information, for every taste and culinary skill level. However, the true power of Rebalance Your Relationship with Food is that it is not just another cookbook. The Self Help Tools section provides holistic information that enables the reader to understand and address their relationship with food. Emma’s passion to help affected people understand and overcome their conditions shines through, and I will certainly be recommending Rebalance Your Relationship with Food for clients in my nutritional therapy clinic. Emma’s book is a gentle guiding hand for those who are working hard to repair their relationship with food, and themselves. Sound nutritional advice, delicious recipes and mouth-watering photography are perfectly complemented by the words of those who’ve walked this path before, helping the reader to feel less alone and more hopeful. I think this is one of the most useful and practical books for people recovering from food and body issues that I have read for a long time. It is a must for people who journey through recovery. The meal planner and the food diary are useful tools. They combine well with the motivational messages and self-care ideas to remind the person that recovering is about the balance of food and self. I would recommend this book to my patients with great pleasure. Emma’s book is a brilliant tool for those that are nervous about food to use as a means to help build confidence and knowledge in a very unintimidating, user friendly way. I see many clients that have years of bad habits to break, that have been overwhelmed by constant mixed messages from the media and fad diets that have only worked to build more confusion and apprehension in regards to what is ‘good’ for them and what is not. This book is great for taking those first steps towards managing a healthy, nutritious diet with some very simple options and on to something more challenging when you are ready. I will definitely recommend Rebalance Your Relationship with Food to my clients. 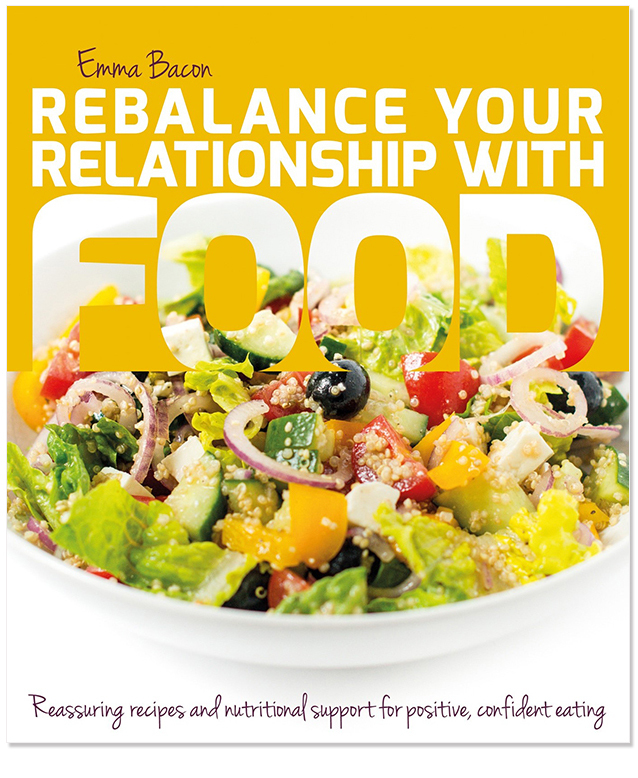 Emma Bacon’s book Rebalance Your Relationship with Food is a brilliant mix of self-help, nutrition and life advice. It is a guide I wish I’d had when I was escaping my own diet prison and longing to live a life that was more than counting calories, stepping on scales and valuing myself based on the size of my jeans. I will recommend this book to my clients and will continue to try the super yummy recipes for myself. Emma has written Rebalance Your Relationship with Food with considerable empathy and understanding. The book is thoughtfully and beautifully presented with nutritional facts and a variety of recipes which are clearly explained. These range from the basic to the more ambitious meals, yet all are simple to prepare. Carbohydrates, proteins, fats, sugars, vitamins and minerals are explained with clarity and brevity. It is particularly impressive in the way that the photos of the meals have a caption to show the health benefits of the various ingredients. It is wonderful to see how the reader is supported in their struggle by so many positive messages to live a healthy and balanced life. It includes a helpful tool kit section as a motivator and a check of progress. Our daughter has been recovering from anorexia for many years and we can honestly say that this is the first ever recipe book we have seen to approach eating disorders in such a practical and supportive way. It will be invaluable to both the person challenged by disordered eating and their supporters. We are deeply grateful to Emma for the extraordinary effort in undertaking this inspirational book. 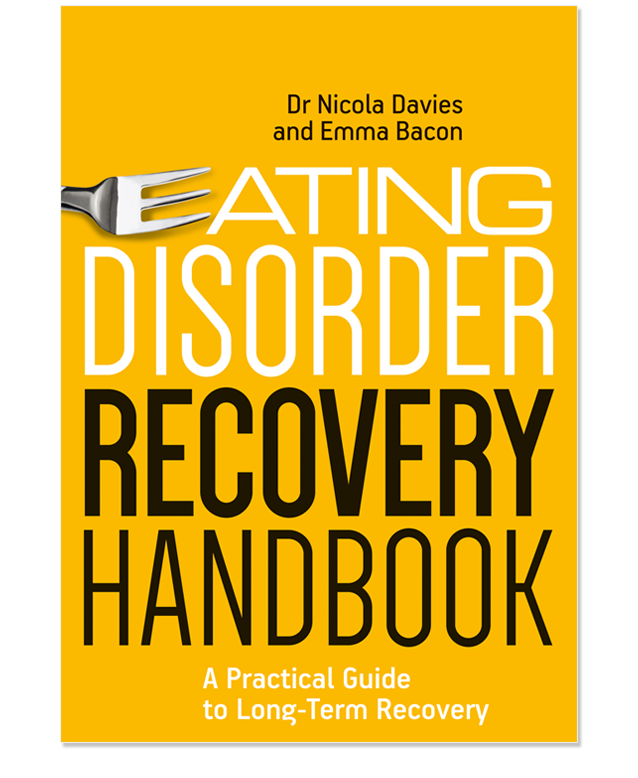 The Eating Disorder Recovery Handbook successfully draws on existing evidence and best practice whilst interweaving the ideas and encouragement of those who have walked the difficult path of recovery before. Offering hope, guidance and a wide range of structured activities, this book will prove a fantastic tool both for people recovering from an eating disorder and those working hard to support them. The topics and self study activities outlined in this book were invaluable in my understanding of myself, my relationship with food, and the real meaning behind my eating disorder. It was a fundamental tool to my recovery. It helped me to see my eating disorder from a different angle and gave me and my family new strategies to overcome it and to see it for what it really was. The handbook is a comprehensive and practical tool to help not just the individual suffering with an eating disorder, but also families wanting to offer support. The destructive nature of the illness frequently pulls families apart. “How did we get to this point?” is a question frequently asked. The sections and the practical ideas in the handbook address the complexity of the illness and enable parents/family members/ carers to gain a better understanding of what having an eating disorder feels like. It provides the platform for honest communication and trust to be built/rebuilt and nurtured. We all make mistakes, despite the best intentions, and there is no point anyone blaming themselves or regretting past decisions. That is wasted time and energy! Instead, the handbook provides the opportunity to reflect in a non-judgemental way and move forward together to challenge the eating disorder. © 2016 Rebalancing-Me. All rights reserved.